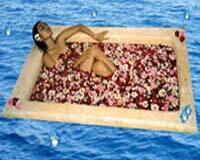 Thalasso Footbath • Body Massage • Seaweed facial or Creme Bath • Spa Gift. This medium firm massages treatment uses Balinese long strong Strokes, Skin rolling, kneading and reflexology techniques to stimulate blood circulation and smooth acting muscles. A gentle, pressure relaxing massage to clear the mind, and soothe and refresh the body. We used warm stones from the Agung Mountain and combine them with a traditional oil massage to provide you with a treatment to relieve muscular aches and pains. Hour Herbal packs are made from aromatic herb, leaves and flower sourced from around Indonesia. This pack steamed and than pressed on to body to relax, relive sore muscles and penetrate deaf warms. This is deeply relaxing treatment. Reflexology aim to rebalance and harmonize the function of the entire body. By applying pressure to various points on the soles, the reflex nerves are stimulated that are systematically linked to all parts of the body. 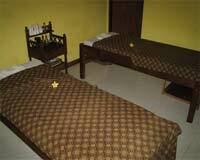 Includes full body massage, Jacuzzi, Herbal boreh, petal flower bath. Stimulates blood circulation.